Enjoyment of delicious, homegrown tomatoes is one reason to grow a kitchen garden. Some people who have room to grow only one item in a pot choose to devote their space to a tomato. In the Deep South, where I live, people love their "'mater sandwiches." The simplest way to make one is to smear white bread with mayonnaise, add a giant, sick slab of fresh, homegrown tomato from a giant tomato, and sprinkle with salt and pepper to taste. Of course, there are variations. Some people toast the bread and add bacon and lettuce to make a BLT (bacon, lettuce, and tomato) sandwich. I personally enjoy adding fresh basil and a slice of fresh mozzarella cheese to my tomato sandwich, with a touch of balsamic vinegar. In the Deep South, we also enjoy slicing a tangy, firm, green tomato into thick slabs, breading it with some salted cornmeal, and lightly frying it, to make fried green tomatoes. Fried green tomatoes are usually served with a topping similar to hollandaise sauce. 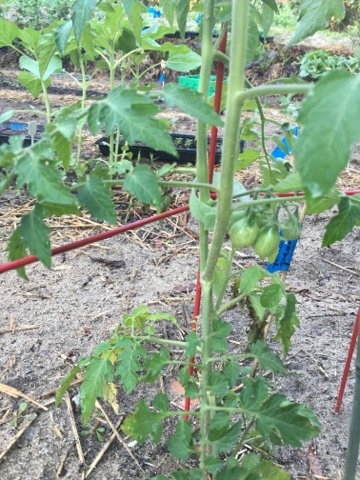 When I was a child, my mother grew cherry tomatoes, in addition to the larger ones. To me, these tasted sweeter as well as tangier. I could never get enough of them. As an adult, I compensate by growing extra. As many get eaten in the garden as make it into the kitchen. While common varieties that ship well (and hence can be sold at markets) are adequate, connoisseurs rave over this or that heirloom variety. While some heirloom varieties are also available in farmers markets, they are also expensive. People who grow their own tomatoes don't just save on cost. They also get to savor the superior texture and taste that can be achieved from a home garden. Tomatoes take at least 75 days to produce fruit from seed. 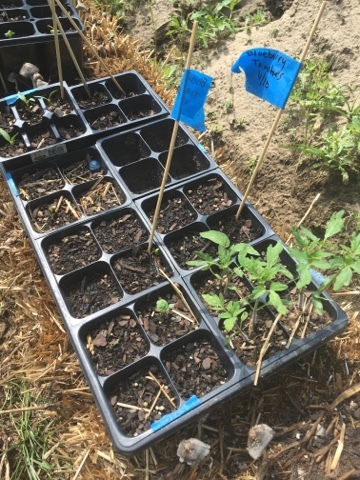 They require warm temperatures to germinate, but they stop producing when temperatures go above 90 or 95 degrees F. (When choosing varieties, pay attention to heat or cold tolerance, something I learned this year.) Because of these temperature demands, most gardeners either start their seedlings indoors (when it's still too cold for them outside) or purchase plants in order to get a head start on the growing season. If they can be kept alive, tomatoes also produce fruit when temperatures are cooler in the fall, up until the first freeze. In addition to nitrogen, they like potassium, phosphorus, and magnesium in their soil. 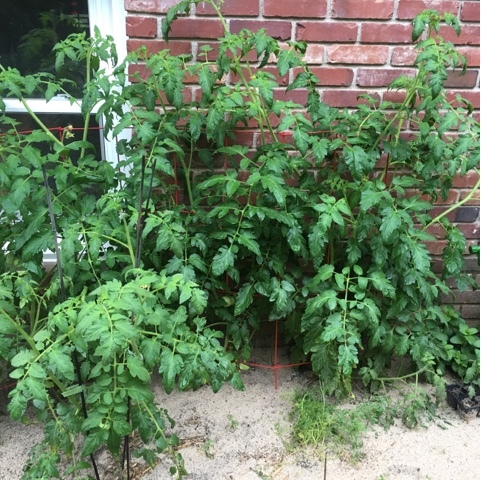 This year, I purchased a half-dozen Better Boy tomato seedlings from Lowes (some are shown in the picture below). I also ordered some heirloom varieties that I started from seed, outdoors after the weather was warm enough. Relying on the Better Boys for basic red tomatoes, the seeds I ordered were Prudens Purple, Aunt Ruby Green, and Blueberry. The skin of the "blueberry" tomato is actually blue when ripe. I also purchased one each of a Cherokee and a yellow plum (cherry) tomato at a specialty garden shop. Hence, if all goes well, I will have tomatoes that are red, yellow, green, purple, and blue! Thank you for reading the personal blog of Alexandria Skinner. Nothing in this blog should be viewed as attorney-client legal advice. The only way Alexandria Skinner creates an attorney client relationship is by way of a written letter of engagement.